It was so quiet today as today was the day the chickadees left. 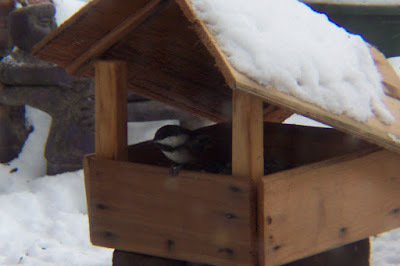 Every year with the exception of one the chickadees disappear. Not sure why one stays behind but one always does. It’s as if one has to stay behind and keep the home fire burning while the others go wherever they go . It’s a bit of a sad day as we look so forward each day to hearing them all chirp away and watch them grab seeds and eat or hide them. We have had their feeder in various places but they really like the current one as they have become so bold they tap on the window sill when the feeder is empty. 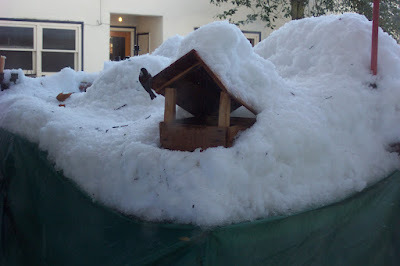 Here’s a shot at the current feeder where they had to navigate a giant icicle when we had the cold snap. 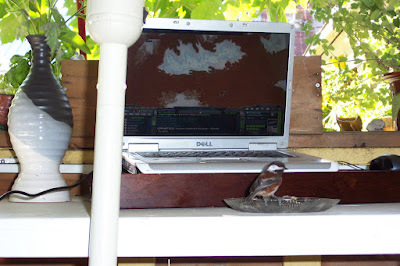 The bird song we enjoy around our little homestead is such a blessing. Perfection would be a babbling brook running by to go along with the bird song. Thought we would share some of our favourite chickadee moments. I think that chickadees are the dearest of birds. You are so fortunate to have them with you for however long.